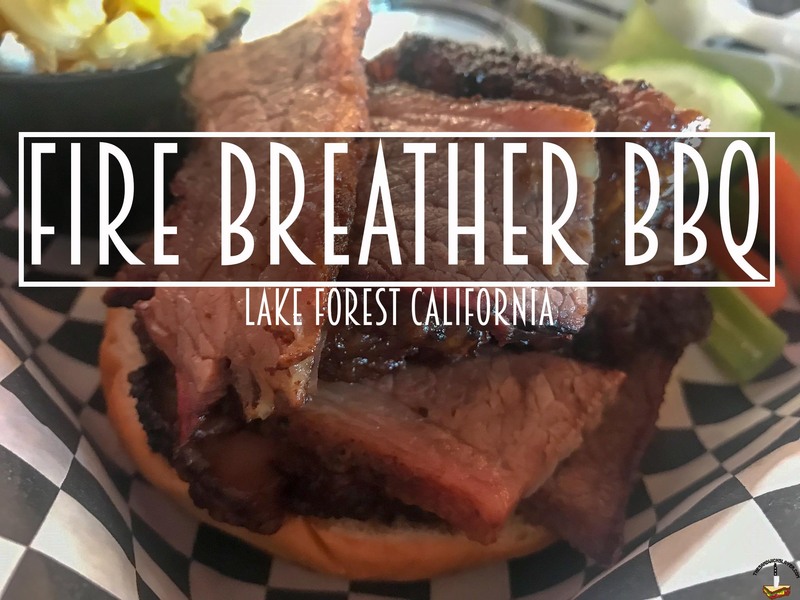 Fire Breather BBQ in Lake Forest CA has re-ignited a passion for BBQ that has long laid dormant. I stumbled upon this restaurant whilst getting a cheesesteak at the Philly’s Best next door and it totally made my day (because I ate a cheesesteak and BBQ in one sitting, don’t judge me). Fire Breather BBQ prepares their meats Texas style with their signature dry rub. There are only two sandwiches on their menu: Beef brisket or pulled pork. I could’ve slowly convinced myself to order both but I still had a cheesesteak to contend with. 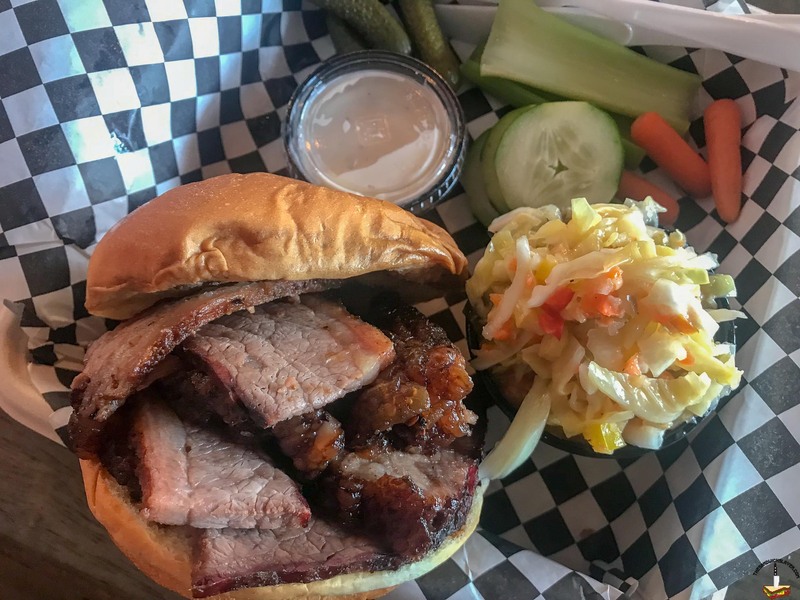 I don’t know a whole lot about the subject, but I learned while traveling in Austin that beef is the king of Texas BBQ; so I went with the brisket. According to the BBQ guide on Thrillist, when one refers to “Texas-style BBQ” they usually mean in the style of Central Texas. The meat is seasoned and indirectly smoked for hours before it is sliced and served. There is little emphasis on sides and sauce, you usually get some pickles or sliced onion with your meat. While I can’t say that Fire breather BBQ has modeled it’s menu after Central Texas style, it certainly feels like it. Their sides are pretty simple, things that don’t require a lot of cooking time like: apple slaw, raw vegetables, and potato salad. You’re going to hear me say this about most BBQ places that I try, but the bread here is kind of an after thought. Fire Breather uses a Hawaiian bun for their sandwich, it’s pillowy and soft with just a touch of sweetness. While it’s not groundbreaking, it happens to work well with their beef brisket. It balances the smoke and fat of the meat without being intrusive, the slight sweetness also gives it just a little bit of variation to keep things interesting. In a world where sandwiches are filled with Sriracha mayo, chipotle something or other, and buffalo style pretzel chips or whatever, it’s nice to just have a sandwich as simple as beef brisket and bread. I felt very much like John Montague, Fourth Earl of Sandwich at the gambling table, eating a simple sandwich to keep his fingers from soiling the playing cards. I doubt the Earl of Sandwich was eating 7 oz of slow cooked beef brisket (his loss), but nevertheless, I felt his kindred spirit. All joking aside, Fire breather BBQ’s beef Brisket is probably the best I’ve had so far outside of Texas itself. I suspect the signature dry rub has a lot to do with it, but the beautifully caramelized outer edges of meat just elevated the whole sandwich. There was just enough fat from the deckle to add flavor and some moisture without it tasting fatty. It’s salty outer layers were slightly hardened and sweet, making for a wonderful crust and texture. The sandwich didn’t come with a sauce and quite frankly it didn’t need one. The fatty parts of the brisket add flavor and moisture without masking any of the beef in sauce. Of course if you want a BBQ sauce, Fire breather has one on the table. Unlike sauces you’d get at the supermarket, Fire Breather’s BBQ sauce is much more tangy and thin. It’s quite different from the sweet and thick sauce that most people are used to. At $12 for 7oz of meat with two sides you really can’t go wrong. Honestly, I’d pay $12 for the meat by itself. There aren’t really a lot of sides to choose from, but the amount of food you get for twelve bucks is worth your consideration. 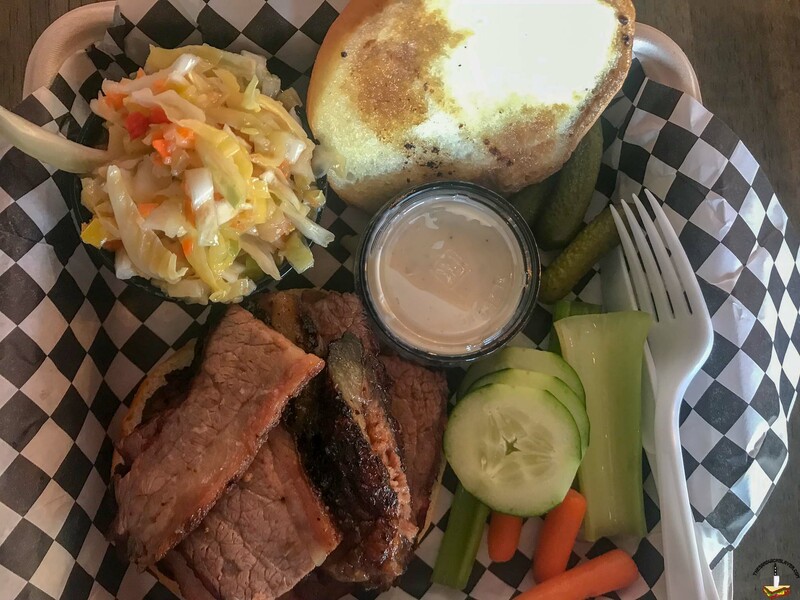 BBQ is rarely the cheapest option when it comes to sandwiches, but Fire breather’s brisket kind of speaks for itself. 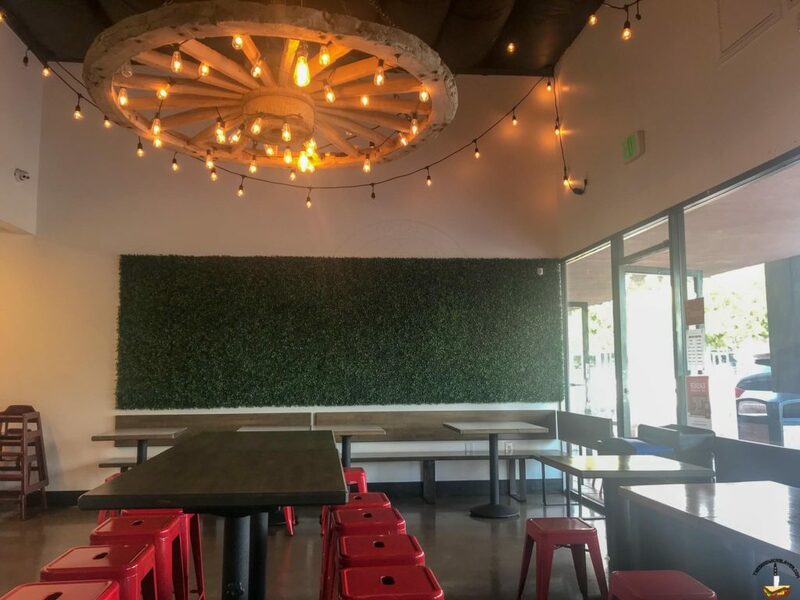 So it’s safe to say that this restaurant has some of my favorite beef brisket in Orange County. The choice of side dishes leaves a lot to be desired, but I would come here to eat the brisket alone. By the time I got to my car, filled with waaay too much beef, I thought about my future struggles in Lake Forest. Every time I go to this business center, I’m going to be in a constant struggle between cheesesteaks and brisket sandwiches. Sure, I ordered both this time around, but I certainly can’t do that all the time (or can I?). 45 minutes later, the food coma hit me and I was done.